If you’re searching for clues about the election result in the latest batch of opinion polls, good luck. Their forecasts seem to be all over the place. Take the three polls to be published in the last 24 hours. One gives Labour a lead over the Tories of seven points (Opinium for the Observer), another suggests two points (YouGov for the Sunday Times) and a third no points at all (Survation for the Mail on Sunday). Meanwhile Ukip are on either 16% (YouGov), 17% (Opinium) or 25% (Survation). Since the start of October we’ve had two polls putting Labour seven points ahead of the Tories and two polls putting them two points behind. We’ve also had the Liberal Democrats as high as 10% and as low as 6%, while the Tories have shuttled between 36% and 28%. But take a step back and look at the trends. 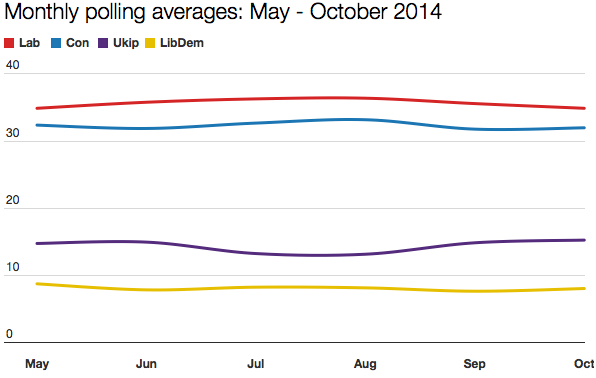 The averages for the four main parties so far this month are 34.9%, 32%, 15.3% and 8.1%. Six months ago the ratings were 34.9%, 32.4%, 14.8% and 8.8%. Not that much change at all – and in the case of Labour, no change whatsoever. Things have been quiet. Strikingly so. Labour has drifted up and down, but only within a margin of 1.5 points. The Tories’ margin is even smaller: 1.3 points, and the Lib Dems’ smaller still: 1.1 points. As for Ukip, it has neither soared nor plummeted. Its lowest has been 13.3% and its highest 15.3%. So best not to get distracted by headlines screaming about record poll leads for this or that party, or to find solace (or trauma) in stories that say a party is set to lose or gain dozens of MPs. Ignore such talk. It’s all conjecture anyway. Individual polls are at best only snapshots, not predictions. And trends aren’t predictions either, merely sets of numbers that tell their own story – which may or may not have bearing on the only set of numbers that truly matter: the ones on polling day.